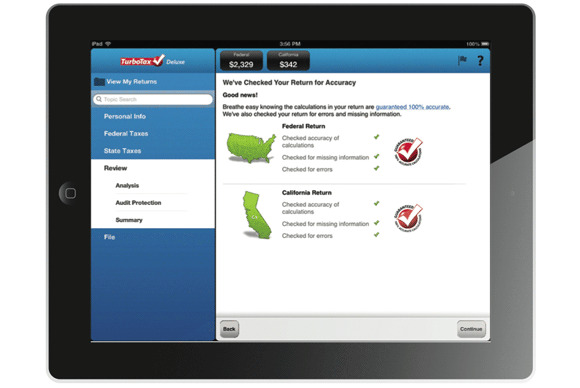 TurboTax 2012 for iPad is a departure from Intuit’s past iOS offerings. Where in the past your only iOS options were for basic tax filings, TurboTax 2012 for iPad is a full-featured tax filing application that is equally as capable as both the desktop versions of the same software available for Mac or Windows. As is the case for all tax apps, you’re required to go through an interview process before you get down to the business of entering your W-2s and other personal financial information. This interview consists of questions about changes in your personal life: Did you get married? Divorced? Have children? Marry one off? As well as questions about changes in your work life. If you’ve used TurboTax in the past you have the added benefit of being able to import last year’s return, and thus all of your personal information, using iTunes’ file sharing feature. Twenty Question: Just like any desktop version of TurboTax, TurboTax 2012 for iPad's interview process asks questions to determine what financial information and which forms you'll need to complete your tax return. Like Intuit’s SnapTax, TurboTax 2012 for iPad offers you the option of snapping a picture of your W-2 to automatically import your tax information. Interestingly, while SnapTax had difficulty performing accurate OCR on landscape-oriented W-2s, I found that TurboTax 2012 for iPad had difficulty properly mapping data from portrait-oriented W-2s. If you choose to use this feature you’ll always want to double check that your financial data is entered correctly. Oddly, you cannot use the camera to import 1098 or 1099 information. Once W-2 and other income information is entered you’re walked through a series of questions regarding a variety of personal finance and family situations. The way you answer each question determines what forms TurboTax 2012 for iPad will have you fill out. The interview process easily handles very specific types of situations, but you are always able to view and enter data in any form you need to if you think that TurboTax 2012 for iPad has missed a form that you think you need. While TurboTax 2012 for iPad is free on the iTunes app store, what you’ll pay to file your taxes varies depending on your specific needs. That determination is made based upon the questions you’ve answered during the interview process and the forms TurboTax 2012 for iPad has determined you will need. Payment for filing from the app is handled as an in-app purchase. TurboTax 2012 for iPad is an excellent option for filing your personal and small business taxes. As full-featured as both Mac and Windows versions of the same application, TurboTax 2012 for iPad guarantees that you need look no further than you iPad to handle all your tax filing needs.